John Duffy. Served November 1952 to November 1954. First at Gangodawila and then on the transfer of the main signals centre to Negombo. Dickie Duncan 1957 to 1960 Jungle Rescue, Station Signals and Commcen Ceylon. 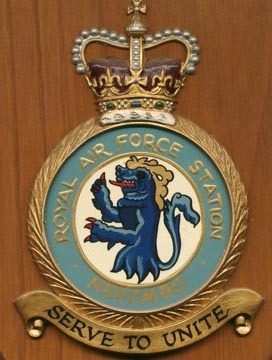 RAF Negombo was developed as a major Staging Post for aircraft in transit to and from the Far East in 1945. Situated in a plantation of coconut trees Negombo was selected as the proposed airfield being positioned 19 miles North of the Ceylon (Sri Lanka) capital Colombo and just a handful of miles East of Negombo with the main Negombo Rail and Road network running immediately to the West of the RAF Station. Although built as a single runway a further runway was planned in 1945 running parallel to the East-West runway along what was the 9 hole golf course but was never added. On 1st February 1960, RAF Katunayake started its rundown as a Staging Post (so says my RAF service history) as RAF Gan had by now become fully operational, I in fact had my overseas tour shortened by some 5 months, some would say a Cook's Tour as a result of this closure! Or doing G.C.T. at D.L.A. And it revels in the name of Monsoon Drain! Who dream of home 6000 miles away! Aircraft passing through from 1958-1960. I would also like more stories to add to the Kat page. For example one chap jumped a Hastings bound for Changi and when discovered was held under 'close arrest', released, then had a couple of weeks 'holiday' before being returned to Kat and for his efforts received the GSM! If you are this person, how about sharing this one with all the others? Another got involved in the riots and was shot at by machine gun fire, only to escape with his life! These stories are not to be found in the National Archives at Kew as generally they were hushed up at the time and officially do not exist. So the 30 year rule has passed so come on lets here these bazaar stories. There was also a story about the floods in 1956/57 and the station flight hack was sent up to drop essential supplies to those that were marooned, such items as large cans of jam were discharged from the aircraft and people could be seen running with arms outstretched trying to catch them, but tin openers was not an optional extra. Don't let these stories disappear, they may be unique to us, if you do not want your name added as your contribution that is OK by me. The Flights "Neg F" and "Neg P" were the two flights from Changi and as far as I can remember the Neg F came in on Tuesday and returned on the Thursday. The day off on the weds. was usually a flight up to China Bay or a day off if nothing to go there for. (When they started building Gan then it used to go down there taking Pakistani Labourers with one of the Movers as AQM sitting in the Co-pilots seat-I did several flights down there) When the floods were on in 1958 the Wednesday lay over was used to drop the tins of Jam and bread in large hessian bags. There was only one set of despatcher harness available and when I went up to help just had lashing tape tied round my waist-rather hairy to put it mildly especially looking back on it now but its surprising what you'll do when you're in your twenties (early) and think nothing of it!! The only dodgy bit was after the board of bags had been despatched and the Valetta was banking round hard to go in again-it paid to hang on especially as you were crawling back up the fuselage to drag some more of these large bags down aft to the despatching board! Yes, the local population did run after the bags as they came down but it was more a case of whoever got to them first had first pickings and I gather several did get hit by the bags. As far as I can recall there was only bread and tinned jam in the bags and nothing to open the tins with. When Ratmalana Airport closed for repairs after the proving flight of the BOAC Britannia had cracked the runways/taxiways all the civil flights used to come through Negombo which was great seeing all those stewardesses wandering around Air Movs!!! The downside was that the Singalhese Customs took up residence which caused a problem especially when the Neg P flight came back from Changi. Everyone used to try and get a weeks leave or so at Changi before being Tour Ex to load up with goodies to take home.So all the passengers had an awful lot of duty free goods from Changi but which were ultimately destined for the UK, but you try explaining that to the Singalhese Customs!! The first flight in got clobbered unfortunately and had to pay an a lot of import duty or lost the goods. The next week we were a bit more organised and when we went out to meet the Hastings told everyone to just bring off their hand luggage with nothing dutiable in it and take that through and admit to no other luggage. Then we offloaded all the remaining bags onto a couple of SASF trolleys and took them over to SASF where the passengers collected them after having gone through Customs! It only happened a couple of times as the customs presence was only there for the civil aircraft so if none were coming in then all was OK. Some of the 52/110 Squadron Valetta crews that flew the Changi/Butterworth/Car Nicobar/Negombo/Gan 'Air Bridge' and reverse and often to be referred to as Gan Air or Gan Pig Run. Thanks to Ken Denman for this information. Some of my own brief experiences. The day a mongoose got into the Airmens Mess and caused panic, me falling off a Comet wing and breaking my wrist but the physiotherapy was put to good use in the bar later that night. SASF playing soccer, our shirts were sky blue pyjama tops. Learning to play golf when the crows would pinch the golf balls and take them as trophies to the nests in the coconut trees, talking of which there were 40000 of 'em! The confined to camp situation when Prime Minister Bandaranaike was assassinated, the train rides from Katanayaka station to Colombo, watch out for the beetel nut stains, the even hairier taxi ride through the streets of Colombo. The rocket attacks between billets, the sergeants mess and the Astra from illegal rockets bought from Kurana village, the Chinese restaurant in the village which laid me up in the hospital for three days after a meal. The Christmas Dinners where everyone who wanted to eat had to be dressed in uniform, we sure did, prison uniforms, Army uniforms in fact just about everything that didn't look like a Number 6 dress KD uniform! The boat parties, the orange distress flare let off in the swimming pool, riding your bike to work in the middle of the road in order that you didn't get hit by a faling Kadjan leaf. I too took part in the Flood relief sorties in Dec 57/Jan 58. We left Changi on 31 Dec staging through Butterworth and Carnicobar en-route to Katunayake. We did 3 sorties on 31 Dec in the Jaffna/Trincomalee area. The last of these 3 sorties was memorable in that we landed with a large sack of bread and tinned jam "hung-up" on the tailplane. I believe it eventually dropped off on the runway. We then flew to Gan and back on the 1 Jan. On 2 Jan we flew 4 Flood sorties (Trincomalee, Madhu Church & Padawiya, & China Bay. We did 2 more Flood sorties on 3 Jan, went to Gan and back on 4 Jan, 4 more Flood relief sorties on 5 Jan, a Kat-Gan run on 6 Jan and a sortie to China Bay rtn on 9 Jan. My pilots on these sorties were F.Sgt Whitehead and F.Sgt F.Sgt Payne, and the Valettas were VX 558, VX 495 and VX 523. At this time everyone at Gan lived in tents. The first people to get decent accommodation were the Costain's "foremen" who were there to organise the Pakistani labourers. We returned to Changi by Hastings on 13 Jan. I returned to Katunayake on 28 Jan to start my tour on the 52 sqn detachment which came to an end when the Hastings were first able to land on the "not yet completed" concrete runway at Gan. My actual date of departure from Katunayake was 24 April 1959. All our Valetta sorties used the short, rolled coral runway. Its just as well I've got a log-book to recount the above details, and I can remember all the crews who were on the det at Kat. However, the only person I can remember (without prompting) of the people who did all the work on the a/c was Sgt "Ginge" Pearson who was, I believe, an engine man.